It's Faery Hair Friday at the Fernie Brae today! 1-6pm. 4035 SE Hawthorne, across from New Seasons. Drop in anytime! The Fernie Brae is a beautiful faery themed gallery and gift shop. Come marvel at the magic! Friday, January 29th: 1pm-6pm, Faery Hair Friday at the Fernie Brae, 41st and SE Hawthorne, Portland, drop in! Tuesday, February 2nd: 4-7pm, *New weekly Event! * Tuesday Twinklings! 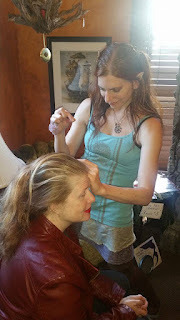 Faery Hair Every Tuesday - This week's location Townshend's Teahouse, 2223 NE Alberta St, Portland, drop in! Thursday, February 4th: 10am-1pm, Faery Hair First Thursdays at Grand Central Bakery Beaumont, 4440 NE Fremont St, sparkles by bike, drop in! Friday, February 5th: 1pm-6pm, Faery Hair Friday at the Fernie Brae, 41st and SE Hawthorne, Portland, drop in! Saturday, February 6th: 10am-6pm, Riona's Cave of Treasures craft faire, Doubletree Hotel, 1000 NE Multnomah St, Portland, $1 admission, find us with the PDX Browncoats! Tuesday, February 9th: 4-7pm, *New weekly Event! * Tuesday Twinklings! Faery Hair Every Tuesday at various locations in NE or SE Portland cafes, check back for weekly location, drop in! Wednesday, February 10th: 5-8pm, Faery Hair Happy Hour every 2nd Wednesday at Belmont Station, 4500 SE Stark St, all ages, drop in! Friday, February 12th: 1pm-6pm, Faery Hair Friday at the Fernie Brae, 41st and SE Hawthorne, Portland, drop in! Tuesday, February 16th: 4-7pm, *New weekly Event! * Tuesday Twinklings! Faery Hair Every Tuesday at various locations in NE or SE Portland cafes, check back for weekly location, drop in! Friday, February 19th: 1pm-6pm, Faery Hair Friday at the Fernie Brae, 41st and SE Hawthorne, Portland, drop in! Tuesday, February 23rd: 4-7pm, *New weekly Event! * Tuesday Twinklings! Faery Hair Every Tuesday at various locations in NE or SE Portland cafes, drop in! Friday, February 26th: 1pm-6pm, Faery Hair Friday at the Fernie Brae, 41st and SE Hawthorne, Portland, drop in! *Did you know that Fhairy Strands are pure silk? Others may use different products, but Dancing Hands and I only use silk for our faery hair. *I have a Square reader, so I can take cards! Happy New Year from the Faeries!